The Center for Sustainable Groundwater has been created to provide hydrogeologic understanding to the extraction and management of subsurface water. Center staff’s knowledge has been gained through years of drilling and geophysical surveying , and during our staff’s earlier careers with state, local, and regional government, and private consulting. Part of the mission of the Center is to “demystify” groundwater occurrence, particularly in fractured bedrock hydrogeolgic settings, where misconceptions about groundwater abound, which can lead to poor management decisions for both private and community wells. When rain falls from the sky, part of it runs off along the surface and flows into creeks, rivers, lakes and the ocean. Part of it gets soaked up by trees and plants, and evapo-transpires back into the atmosphere. The rest soaks into the ground and becomes groundwater recharge. The proportion of rainfall that actually ends up recharging groundwater is influenced greatly by land cover. Undisturbed forest land may allow 50 or more percent of rainfall to soak into the ground…..an asphalt parking lot does not permit any rainfall to soak into the ground. 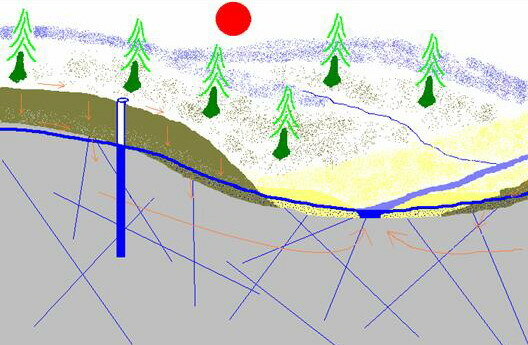 An idealized surface wa ter / groundwater regime for the rolling hills east of the Blue Ridge in central Virginia is shown in the diagram. Rainwater that enters the ground becomes groundwater, and moves slowly downward through soils and saprolite (weathered rock), into the underlying fractured bedrock. In stream and river bottoms, alluvial material (yellow in the cartoon) also serves as a conduit for groundwater. The water table is shown in blue. Below the water table, the soils, saprolite, bedrock and alluvium are saturated with groundwater. Above the water table, both air and water, occupy the spaces between soil and mineral grains, and fractures in the bedrock. When rain falls from the sky, part of it runs off along the surface and flows into creeks, rivers, lakes and the ocean. Part of it gets soaked up by trees and plants, and evapo-transpires back into the atmosphere. The rest soaks into the ground and becomes groundwater recharge. The proportion of rainfall that actually ends up recharging groundwater is influenced greatly by land cover. Undisturbed forest land may allow 50 or more percent of rainfall to soak into the ground. In contrast, an asphalt parking lot does not permit any rainfall to soak into the ground. 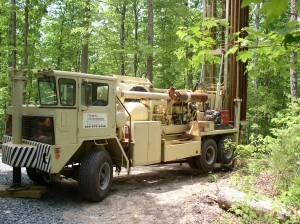 There are a number of types of wells that are in use in central Virginia. Hand-dug wells and wells that are bored with an auger penetrate soil and saprolite to maximum depths of about 75 feet, but do not penetrate the solid bedrock beneath. This type of well continues to be widely used in many parts of the world for domestic, agricultural and other uses, because of the relative ease (and economy) of construction. These wells are, however, vulnerable to seasonal fluctuations in the water table and to contamination from surface waters. In Virginia, shallow wells that are constructed above bedrock can be reliable water sources if sited in conditions where amply near-surface groundwater occurs throughout the year. If the well is intended for domestic use, particular care must be exercised to prevent near-surface contaminants from entering the well. In many localities, public Health Department regulations do not permit this type of well for a drinking water supply. 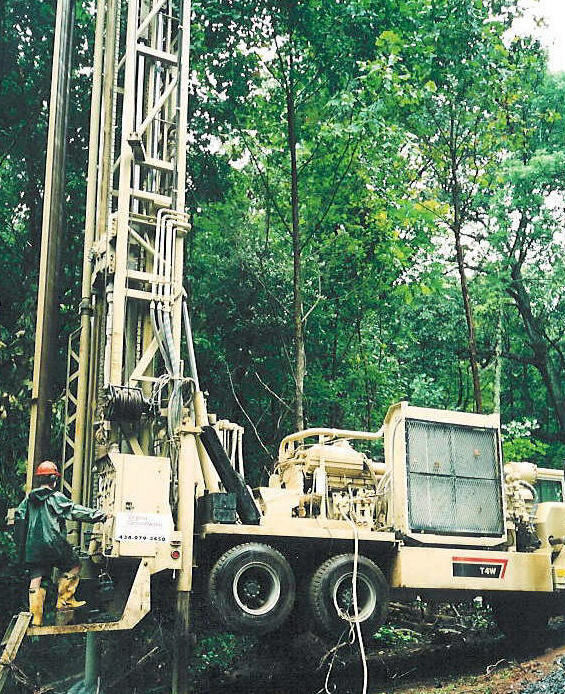 Drill ed wells tap sources of high quality groundwater in the bedrock, below the level of soils and saprolite, at depths of up to several hundred feet. These wells are cased, or sealed, from the surface downward through soils and saprolite to the top of the bedrock, in order to prevent direct infiltration of surface waters into the well. Ideally, the water that is pumped from a deep drilled well has spent a long time percolating downward through soils, saprolite, and the bedrock itself, and has been cleansed of biological and chemical impurities. 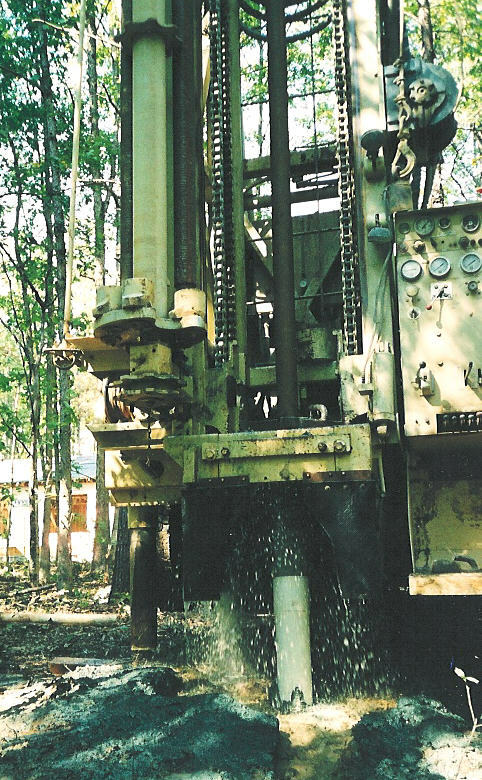 Drilled bedrock wells constructed with and air-rotary rig are the most common type in most localities for supplying domestic and industrial water needs. 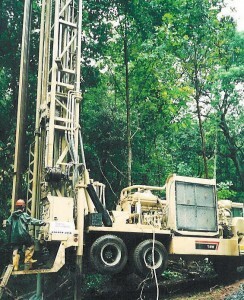 Air-rotary technology uses c ompressed air to operate a pneumatic hammer that breaks the rock as drilling proceeds. 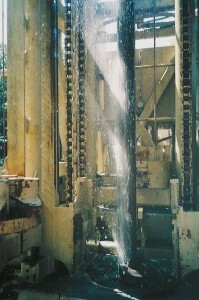 Air circulation also clears the broken rock and cuttings from the bore hole as the well is deepened. While compressed air enables these rigs to make rapid progress through very hard rock, under some conditions, down-hole air pressure can force cuttings into the very fractures that could contribute water to the well, potentially diminishing the ultimate yield of the well. The purpose of the well casing is twofold: (1) casing prevents the well from collapsing where the well penetrates poorly consolidated formations (such as soil and saprolite) and (2) casing prevents contaminants such as septic field effluents from entering the well. The well casing extends through layers of soil and saprolite into the top of the bedrock. Below the bottom of the casing, the well is just an open hole in the rock. When properly constructed and grouted, the only water that can enter a drilled bedrock well comes from fractures in the rock. Another type of rig that is less common today (although in use for many more years than the modern air-rotary) is the so-called cable-tool rig. These rigs break the rock by percussion from a weighted hammer on the end of a woven cable, that is repeatedly impacted on the bottom of the drill hole with a slight spin. Cuttings are removed from the hole periodically by lowering a cylindrical “baler” with a one-way valve at its bottom into the hole.Â Cuttings and water flow upward into the baler, which is hoisted to the top and dumped at the surface. The cable tool is not as fast as a big air-rotary rig, but has the advantage of not occluding water-bearing zones as drilling proceeds.